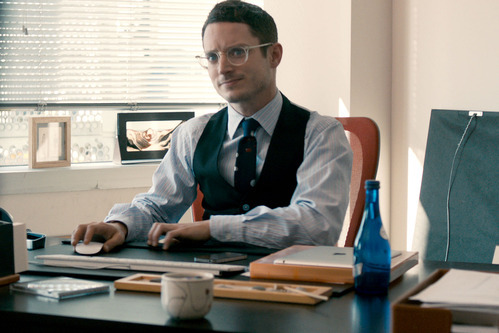 Starring: Rashida Jones (The Social Network), Adam Samberg (I Love You, Man), Elijah Wood (Sin City) and more. Rated: Rated R for language, drug use, and sexual content. Celeste and Jesse Forever took forever to end. Even though in reality, the film is only an hour and a half, Celeste and Jesse’s heartache seems to carry on for eternity at points. However, that being the case can actually be a testament to the excellent and true portrayal of hardships in relationships that go through undefined and unexpected changes. (It’s a double-edged sword). The film could’ve ended before it did as it seems to wander in its direction and is fluffed with a few less than necessary scenes and dialogue. It SEEMED to go nowhere for a while and literally took For.Ev.Er. to get there. The film also introduces a characters throughout and brings them back in recurring scenes, however none of them end up ultra-memorable or even all that likable. The movie lacks a reason to cheer on any one character in the film. While they are relatable (with characters ranging from the “always right” girlfriend who sets to divorce her husband/bestest friend and then gets bitten by the jealousy/lonely bug, to the best friend/advisor who probably watches too many advice talk shows, to the crazy, live-in-the moment friend whose drug-induced loose grip on reality adds a bit of comic relief), it is the relationship as opposed to the characters that begs for the most support of the audience which makes most of the events and people not involving the relationship to be seemingly secondary and unimportant. Mr. Frodo < Celeste & Jesse. Sorry, Mr. Frodo! Along with semi-unimportant characters, the film also carries some underplayed/unimportant subplots. They are of no particular consequence, but beg the question as to why they may have been included in the first place. i.e. Emma Roberts’ continuing yet underdeveloped story as a popstar. This romantic comedy is balanced in its amount of, well, romance and comedy! The chemistry between Samberg and Jones is genuine and quickly allows audiences to buy into all of their inside jokes, funny quirks, and struggles between one another. In an awkward down-to-earth way, Jones and Samberg portray their characters quite impressively. They nail the reality of a relationship that anyone who has gone through a breakup or divorce can relate to. 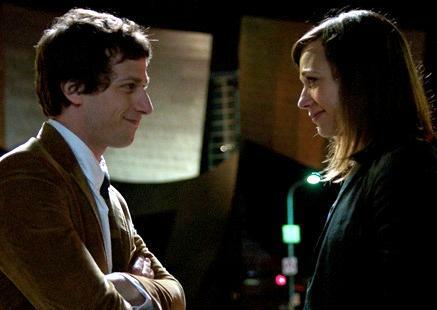 It’s nice to see Andy Samberg in a role in which his popular brand of comedy takes a backseat to drama and storytelling.In this rather authentic rom-com (which is a welcome site given the recent offerings of the redundant genre) both of the main characters are not ready or willing to accept and admit that their relationship is over, nor are they seemingly willing to define where their marital/romantic relationship ends and their ultra-close friendship begins…if at all. I enjoyed Celeste & Jesse Forever. With some fun supporting actors to boot, Celeste & Jesse Forever is sappy and serious, heartwarming and heartwrenching, real and romantic, and genuinely good. A “dramedy” that borrows greatly from other seriously toned relationship films, yet brings enough variety and unpredictability (rare for rom-coms…perhaps this is better categorized as an “Anti Rom-Com.”) to be unique, much like relationships are in real life. Sounds like one I will watch on the sofa with my wife all snuggled up! anytime, Andina. Thanks for reading. How was your break/hiatus?